Turbulent mixing produced by breaking of internal waves plays an important role in setting the patterns of downwelling and upwelling of deep dense waters and thereby helps sustain the global deep ocean overturning circulation. A key parameter used to characterize turbulent mixing is its efficiency, defined here as the fraction of the energy available to turbulence that is invested in mixing. Efficiency is conventionally approximated by a constant value near one sixth. Here we show that efficiency varies significantly in the abyssal ocean and can be as large as approximately one third in density stratified regions near topographic features. 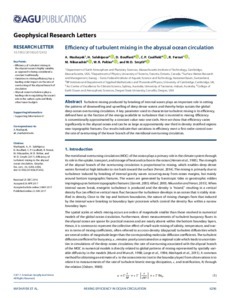 Our results indicate that variations in efficiency exert a first-order control over the rate of overturning of the lower branch of the meridional overturning circulation.